On 28th September (Friday), Pacific Islands Centre (PIC) and Japan Pacific Islands Association (JAPIA) jointly hosted a send-off party for The Hon. Mr. Norio Saito, Ambassador Extraordinary and Plenipotentiary of Japan to Republic of the Marshall Islands, who is scheduled to take his post sometime in the early part of this October. The party started with the welcoming speech by Dr. Izumi Kobayashi, President of JAPIA, followed by Ambassador Mr. Saito’s speech. Then, Mr. Saito, Director of PIC, made a toast. More than 50 people including the delegates for the last year’s Marshall Islands business exchange mission as well as companies and university professors having relations with the Marshall Islands gathered on that day. 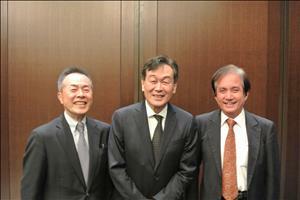 They proactively exchanged their views for growing ties between the Marshall Islands and Japan. 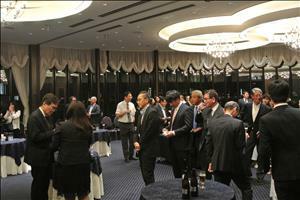 The party was very successful as those participants became fascinated by frank personality of Ambassador Mr. Saito. We pray for his safe trip to the Marshall Islands while wishing him enjoy every success in his new responsibilities.